Lesotho (/ləˈsuːtuː/ (listen), Sotho pronunciation: [lɪ’sʊːtʰʊ]), officially the Kingdom of Lesotho (Sotho: 'Muso oa Lesotho), is an enclaved country–the only one in the world outside of the Italian peninsula–within the border of South Africa. It is just over 30,000 km2 (11,583 sq mi) in size and has a population of around 2 million. Its capital and largest city is Maseru. As of 2010 the People's Charter Movement called for the practical annexation of the country by South Africa due to the HIV epidemic. Nearly a quarter of the population tests positive for HIV. The country faced high unemployment, economic collapse, a weak currency and poor travel documents restricting movement. An African Union report called for economic integration of Lesotho with South Africa but stopped short of suggesting annexation. In May 2010 the Charter Movement delivered a petition to the South African High Commission requesting integration. South Africa's home affairs spokesman Ronnie Mamoepa rejected the idea that Lesotho should be treated as a special case. "It is a sovereign country like South Africa. We sent envoys to our neighbours – Botswana, Zimbabwe, Swaziland and Lesotho – before we enforced the passport rule. When you travel from Britain to South Africa, don't you expect to use a passport?" Basutoland was a British Crown colony established in 1884 due to the Cape Colony's inability to control the territory. It was divided into seven administrative districts: Berea, Leribe, Maseru, Mohale's Hoek, Mafeteng, Qacha's Nek and Quthing.Basutoland was renamed the Kingdom of Lesotho upon its independence from the United Kingdom on 4 October 1966. 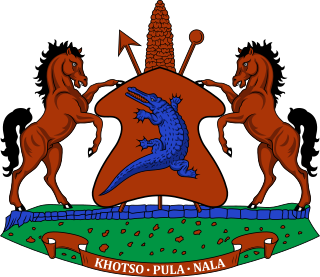 The Kingdom of Lesotho is divided into ten districts, each headed by a district administrator. Each district has a capital known as a camptown. The districts are further subdivided into 80 constituencies, which consist of 129 local community councils. Most of the districts are named after their capitals. Hlotse, the capital of Leribe District is also known as Leribe. Conversely, the Berea District is sometimes called Teyateyaneng, based on its capital. The Drakensberg (Afrikaans: Drakensberge, Zulu: uKhahlamba, Sotho: Maluti) is the name given to the eastern portion of the Great Escarpment, which encloses the central Southern African plateau. The Great Escarpment reaches its greatest elevation in this region – 2,000 to 3,482 metres (6,562 to 11,424 feet). It is located in South Africa and Lesotho. Lesotho has taken advantage of the African Growth and Opportunity Act (AGOA) to become the largest exporter of garments to the US from sub-Saharan Africa. American Brands and retailers sourcing from Lesotho include: Foot Locker, Gap, Gloria Vanderbilt, JCPenny, Levi Strauss, Saks, Sears, Timberland and Wal-Mart. In mid-2004 its employment reached over 50,000 mainly female workers, marking the first time that manufacturing sector workers outnumbered government employees. In 2008 it exported 487 million dollars mainly to the U.S.A. Since 2004 employment in the sector was somehow reduced to about 45,000, in mid-2011, due to intense international competition in the garment sector. It was the largest formal sector employer in Lesotho in 2011. The sector initiated a major program to fight HIV/AIDS called Apparel Lesotho Alliance to Fight AIDS (ALAFA). It is an industry-wide program providing prevention and treatment for the workers.Lesotho, is a member of the Southern African Customs Union (SACU) in which tariffs have been eliminated on the trade of goods between other member countries, which also include Botswana, Namibia, South Africa, and Swaziland. Lesotho, Swaziland, Namibia, and South Africa also form a common currency and exchange control area known as the Rand Monetary Area that uses the South African rand as the common currency. In 1980, Lesotho introduced its own currency, the loti (plural: maloti). One hundred lisente equal one loti. The Loti is at par with the rand. The history of people living in the area now known as Lesotho () goes back as many as 40,000 years. The present Lesotho (then called Basutoland) emerged as a single polity under paramount chief Moshoeshoe I in 1822. Under Moshoeshoe I, Basutoland joined other tribes in their struggle against the Lifaqane associated with the reign of Shaka Zulu from 1818 to 1828. Subsequent evolution of the state was shaped by contact with the British and Dutch colonists from Cape Colony. Missionaries invited by Moshoeshoe I developed orthography and printed works in the Sotho language between 1837 and 1855. The country set up diplomatic channels and acquired guns for use against the encroaching Europeans and the Korana people. Territorial conflicts with both British and Boer settlers arose periodically, including Moshoeshoe's notable victory over the Boers in the Free State–Basotho War, but the final war in 1867 with an appeal to Queen Victoria, who agreed to make Basutoland a British suzerainty. In 1869, the British signed a treaty at Aliwal with the Boers that defined the boundaries of Basutoland and later Lesotho, which by ceding the western territories effectively reduced Moshoeshoe's kingdom to half its previous size. The extent to which the British exerted direct control over Basutoland waxed and waned until Basutoland's independence in 1966, when it became the Kingdom of Lesotho. However, when the ruling Basotho National Party (BNP) lost the first post-independence general elections to the Basotho Congress Party (BCP), Leabua Jonathan refused to cede and declared himself Tona Kholo (Sesotho translation of prime minister). The BCP began an insurrection that culminated in a January 1986 military coup forced the BNP out of office. Power was transferred to King Moshoeshoe II, until then a ceremonial monarch, but forced into exile when he lost favour with the military the following year. His son was installed as King Letsie III. Conditions remained tumultuous, including an August 1994 self-coup by Letsie III, until 1998 when the Lesotho Congress for Democracy (LCD) came to power in elections which were deemed fair by international observers. Despite protests from opposition parties, the country has remained relatively stable since. The Lesotho Defence Force (LDF) is the military of Kingdom of Lesotho, which consists of about 3,000 personnel and is tasked with maintaining internal security, territorial integrity, and defending the constitution of Lesotho. Since the mountainous kingdom is completely landlocked by South Africa, in practice the country's external defence is guaranteed by its larger neighbour, so the armed forces are mainly used for internal security. The LDF is an army with a small air wing. The military was established in 1978. Since its establishment, the Lesotho Defense Force has had a long history of usurping civilian rule, being responsible for the military coup in 1986, internal conflicts in 1994 and 1998, and unrest in 2007. The most recent was the attempted coup by army commander Lt. General Tlali Kamoli in August 2014. A brief crisis also occurred in September 2017 when Kamoli's successor Lt. General Khoantle Motsomotso was assassinated by some junior officers, leading to an intervention by the Southern African Development Community (SADC). The government under Prime Minister Tom Thabane has pledged to reform the security forces as part of the country's process of democratisation. Some commentators in Lesotho have even suggested disbanding the military entirely. Lesotho first participated at the Olympic Games in 1972 and has sent athletes to compete in every Summer Olympic Games since then, except when they boycotted the 1976 Summer Olympics along with most other African nations. Lesotho has never participated in the Winter Olympic Games. To date, no athlete from Lesotho has ever won an Olympic medal. The National Olympic Committee for Lesotho was created in 1971 and recognized by the International Olympic Committee in 1972. The Lesotho national football team, nicknamed Likuena (the Crocodiles), is the national team of Lesotho and is controlled by the Lesotho Football Association. The country has never qualified for the final stages of the World Cup or the Africa Cup of Nations. Lesotho Passports are issued to citizens of Lesotho to travel outside the country. Lesotho–United States relations are bilateral relations between the Kingdom of Lesotho and the United States of America. This is a list of Prime Ministers of Lesotho since the formation of the post of Prime Minister of Lesotho in 1965, to the present day. A total of five people have served as Prime Minister of Lesotho (not counting one Acting Prime Ministers and two Chairmen of the Military Council). Additionally, three persons, Ntsu Mokhehle, Pakalitha Mosisili and Tom Thabane, have served on two non-consecutive occasions. The current Prime Minister of Lesotho is Tom Thabane, since 16 June 2017. This article list the monarchs of Lesotho (also known as Basutoland until 1966). The Orange River (from Afrikaans/Dutch: Oranjerivier) is the longest river in South Africa and the Orange River Basin extends extensively into Namibia and Botswana to the north. It rises in the Drakensberg mountains in Lesotho, flowing westwards through South Africa to the Atlantic Ocean. The river forms part of the international borders between South Africa and Namibia and between South Africa and Lesotho, as well as several provincial borders within South Africa. Except for Upington, it does not pass through any major cities. The Orange River plays an important role in the South African economy by providing water for irrigation and hydroelectric power. The river was named the Orange River in honour of the Dutch ruling family, the House of Orange, by the Dutch explorer Robert Jacob Gordon. Other names include Gariep River (used by the Khoi people), Groote River or Senqu River (used in Lesotho). The Sotho people, or Basotho , are a Bantu ethnic group of Southern Africa, native to modern Lesotho and South Africa, who speak Sesotho. The Basotho have inhabited that region since around the fifth century and so are closely related to other Bantu peoples of the region. The modern Basotho identity emerged from the accomplished diplomacy of Moshoeshoe I who gathered together disparate clans of Sotho–Tswana origin that had dispersed across southern Africa in the early 19th century. Most Basotho today live in South Africa, as the area of the Orange Free State was originally part of Moshoeshoe's nation (now Lesotho). The Southern African Development Community intervention in Lesotho, codenamed Operation Boleas, was a military invasion launched by the Southern African Development Community (SADC), and led by South Africa through its South African National Defence Force into Lesotho to quell a coup d'état. A foreign national wishing to enter Lesotho must obtain a visa unless they are a citizen of one of the eligible visa exempt countries.